Jeannette Walls had a hardscrabble youth. Nomadic, poor, often hungry, she grew up in the desert Southwest and the mountains of West Virginia. She eventually escaped her poverty and moved to New York City, where she became a successful gossip columnist. Her parents moved there too. Only, they soon found themselves homeless. One night on her way to a party, dressed in designer clothes, she saw Mom rooting through a Dumpster. She lowered her head and asked the cabbie to take her home. My, how people would gossip if that were known. Walls made false starts on her memoir four times over 20 years, on each occasion growing so frustrated and fearful that she threw out the entire manuscript. Finally, when she was 44, The Glass Castle was published. It’s been on the New York Times bestseller list for almost three years, has sold more than two million copies, has been translated into 23 languages, and will soon be a movie. In other words, 99.9 percent of people lead boring lives. But every single one of them is trying to make some sense out of his or her existence, to find some meaning in the world, and therein lies the value and opportunity of memoir. It’s therapeutic for the writer, and it eventually even helps his or her descendants understand themselves better. Writing about your life is also about coming to a fresh understanding of it at an age when you probably think you know yourself pretty well. Novelist Stephen King has said, “I write to find out what I think.” He means that until you set an experience down on paper, until you ponder the perfect words to describe it, you can’t fully appreciate or understand it. Threading related experiences together, you see a pattern in the quilt of your existence. It’s about creating a legacy that doesn’t have dollar signs in front of it but has far greater residual value for family and friends. There are as many different types of memoir as there are people. Like Walls and McCourt, you can write about your childhood. You can write about places you’ve visited, as Elizabeth Gilbert did in the blockbuster memoir The Camel Knows the Way, which chronicles her time with Mother Teresa and the Missionaries of Charity. You can write about a crime or injustice you encountered, as Mary-Ann Tirone Smith did in Girls of Tender Age, which traces the murder of a classmate. You can write a memoir about anything, no matter how small or seemingly inconsequential. Everybody has stories shelved in his or her subconscious, awaiting translation. The challenge is getting started, coaxing the story out. (Indeed, there are those who say beginning is half done.) Since there is inherent worth to the endeavor beyond public acclaim, you don’t have to be a professional writer or someone with connections in publishing to succeed. You can write it for yourself. 1. Write memoir, not autobiography. An autobiography is the story of an entire life, but a memoir is just one story from that life. You can only ever write one autobiography, but you can write countless memoirs. It’s a much less intimidating project if you view it that way. Some people have one burning story to tell. Others find it difficult to immediately pinpoint anything. Tristine Rainer, author ofYour Life as Story, recommends diagramming your life to gain perspective. To do this, get in a retrospective mood, enlist the help of a friend or spouse (martinis also work), and plot your life’s six most significant moments. When you do it thoughtfully and honestly, there will usually be one pivotal event that stands out as particularly intriguing and/or meaningful. If there isn’t, don’t worry. There are many different ways to diagram a life. Try dividing yours by critical choices, influential people, conflicts, beliefs, lessons, even mistakes. Experiment until you find the one story that wants to be told, the one experience that really fashioned you. 3. Don’t begin at the beginning. Don’t tell your story chronologically. That’s too predictable. Think of your favorite books. Most don’t start at the beginning. Instead they rivet you with instant action and intrigue. A good beginning is a tease. It gives readers just enough action to hook them without divulging the outcome. Then it flashes back to the real chronological beginning and fills in the background. The best writers create vivid new worlds for readers to inhabit. Yet most budding memoirists produce first drafts that are flat. To transport readers (and yourself), write vividly. This is done through detail, by using all your senses to fully re-create a moment in time. You can teach yourself to do this. The next time you’re waiting in a restaurant, a doctor’s office, or even in traffic, notice the various sights, sounds, smells, and textures. It’s what writers do, both in reality and in their stories. 5. Build your writing muscle. You have a writing muscle, and it needs exercise to perform well. Set a daily goal of writing 200, 500, or even 1,000 words. Set aside a regular time, like early morning, and be disciplined. Don’t worry about making what you write perfect. Just focus on getting the story out. (There will be plenty of time for polishing later.) Above all, relax. Memoir is the easiest type of writing to do well. You’ve already done the research and are intimately familiar with every character. Now you just need to tell it. 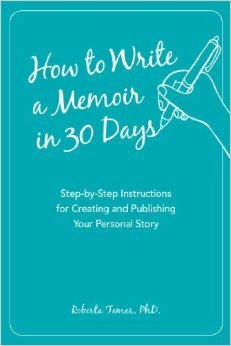 For a quick, fun, and easy guide to writing a personal memoir in just one month, click here for a very special Offer.